Read the first time March 23, 2010. TO REQUEST THAT THE DEPARTMENT OF TRANSPORTATION NAME THE PORTION OF SOUTH CAROLINA HIGHWAY 215 ONEHALF MILE IN BOTH DIRECTIONS FROM ITS INTERSECTION WITH SOUTH CAROLINA HIGHWAY 34 IN FAIRFIELD COUNTY “SOPHIA DONTAE WOODARD MEMORIAL HIGHWAY” AND ERECT APPROPRIATE MARKERS OR SIGNS ALONG THIS PORTION OF HIGHWAY THAT CONTAIN THE WORDS “SOPHIA DONTAE WOODARD MEMORIAL HIGHWAY”. 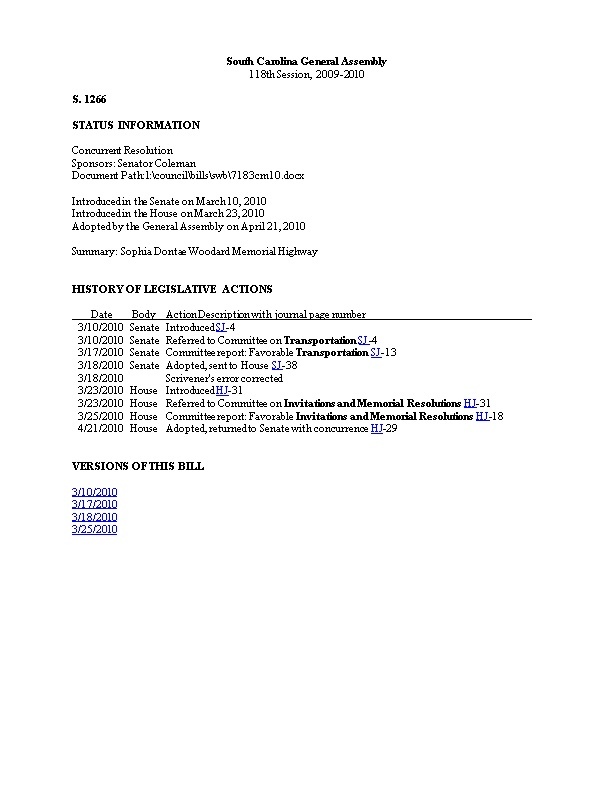 That the members of the General Assembly of the State of South Carolina request that the Department of Transportation name the portion of South Carolina Highway 215 onehalf mile in both directions from its intersection with South Carolina Highway 34 in Fairfield County “Sophia Dontae Woodard Memorial Highway” and erect appropriate markers or signs along this portion of highway that contain the words “Sophia Dontae Woodard Memorial Highway”.